If you're planning a trip to Paris one of the most important things to understand is how to get around the city efficiently. If you have big ambitions to hit all the major sights, shop till you drop, and samples Paris' best eats, you'll need a few tips to help you navigate the city before you arrive. There isn't one definitive answer to the 'best' way to get from point A to point B in Paris but whether you walk, bike, ride the metro or bus, you'll have much more enjoyable trip if you know how each service works, what times they open and close, and how much they cost. The transit in Paris is much like that of New York, London, or Tokyo, it's set up to get you from place to place quickly, efficiently, and cost effectively, so much so that we have never needed to bother with a taxi. First things first, Paris has two transportation systems: The RATP (Régie Autonome des Transports Parisiens or in English: Autonomous Operator of Parisian Transports) and the SNCF (Société Nationale des Chemins de fer Français or in English: National society of French railways Company). The RATP runs the metro (subway), bus system, tram networks and a few of the express RER trains that are located in the city. The SNCF runs the rest of the RER train networks and services suburban Paris. What's great about the RATP and the SNCF is they've come up with an integrated system so you can buy tickets for any of the transit systems in the same ticket office. If you're only planning on traveling within Paris you'll likely use the RATP for the most part. The RER is the train system that runs to the suburban pockets of Paris, as well serves to connect the city (and Metro) to the surrounding airports. This is the easiest and most convenient way to reach central Paris from Charles De Gaulle Airport, and it is also the system you'll take when day tripping to Versailles or Euro Disney. The RER makes stops in the city as well, so you can use it in conjunction with the metro if needed. As long as you're traveling within city center your metro ticket will work on the RER, but if you'd like to ride the RER outside the central city zones you'll need to buy a separate ticket. If you've traveled into the city by train there are seven major stations that you could arrive at, but Gare Du Nord is the most commonly used station for passengers traveling on Eurostar. Austerlitz Saint-Lazare, Lyon and Nord station are all connected to the RER, and the Paris metro so transfers to trains can be made from those stations as well. Paris RER Operating times are around 5:15 am - 12:30 am, dependent on which zone you're traveling in. For route and schedule information see the RATP's website. The Paris metro system is huge and can make your trip much more enjoyable if you know how to use it. There are over 300 stops with 16 separate connecting lines—meaning there's often more than one route to get you where you need to go. The lines are numbered from 1-14. Lines 3 & 7 each have secondary lines that run off of them, making 16 in total. The lines are color coded which makes navigating the underground signs a little easier. 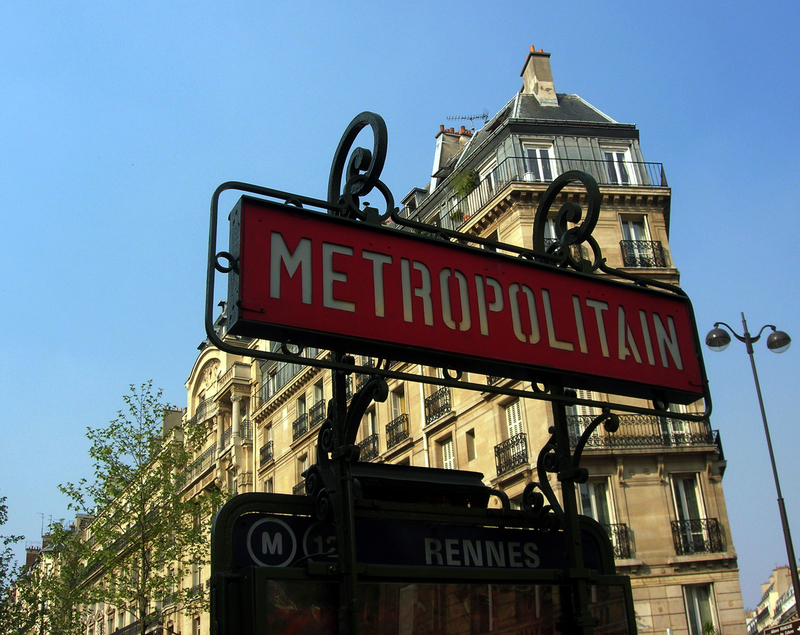 The Paris metro opens at 5:30 am every day and runs until 12:40 am Sunday to Thursday. On Friday and Saturday it is open one hour longer until 1:40 pm. If you have an early flight and have to be at the airport before the metro starts running you will have to consider taking one of the buses covered below. Metro tickets and passes can be purchased at the machines inside each station with a chip credit card or cash. The machines are easy to use and they do have a button that will translate the French language to English, so you can put away that French/English dictionary. You can also purchase your tickets from one of the agents inside the station, the agents will also do their best to help you find the right route and give you a transit map. Although the Paris metro runs in 5 zones, covering the entire city, if you're only visiting central Paris (where most of the shopping and sightseeing are), you'll likely end up using only zones 1 & 2. The costs below are calculated for zones 1 & 2, so if you plan on taking a trip to one of the other zones the cost will be slightly higher. Single or standard Metro ticket (T+): One ticket for a single ride cost €1.70, and is good between line transfers as well as RER transfers. If you know you'll be traveling more than four times throughout one day you're better off to get a day pass (covered below). Carnet - Paris metro book of 10 tickets: A book of 10 tickets can be purchased at a price of €13.30 saving you around 27% from the single fare price. Paris Metro Day Pass: A pass for the whole day will run you €6.40 and is good for an unlimited number of rides during the day. This can be purchased ahead of time and used later, it becomes valid the first time you use it and is good until the end of that day. A day pass is worth buying if you plan on taking more than four metro rides in a day, which isn't a lot if you are an active traveler with a busy agenda. If you plan on exploring only a neighborhood or two per day you can probably skip the day pass. Paris Vista Pass: This is pass is targeted at tourists and, depending on what you're looking to do in and out of the city, this might be a decent option. If you do plan to travel to other regions outside zones 1 & 2 city center, this pass can be useful, and can score you some discounts to boot. The pass can be purchased online or with an agent at a metro station (not at the automated machines). It comes in several time frames (1 day, 2 day up to 5 days) and covers multiple zones in Paris. the most expensive covers zone 1-6 and will run you €53.40, and the cheapest covers only zone 1-2 and costs €9.75. Price varies depending on were you want to travel and you can find the most updated price list, including additional discounts on the Vista website. Ensure you check the attraction discounts to make sure they are things you actually want to do, otherwise you could be spending extra money for no reason. If you only want to visit one or two museums and take a leisurely stroll along the Seine, this pass isn't going to benefit you. Paris Navigo Pass: There is a reusable card that is good for the metro, RER, buses, trams and even the Velib bike system. You can use for a week or month long period, and is typically used by locals—although any traveler can purchase one. The card costs €5.00 for non-locals and will be good for ten years. You must fill out an application, and provide an id photo in order to carry it, which is a deterrent for most tourists. If you'll be in the city for a considerable timeframe and plan to travel around the city on the transit, this is a smart way to go. There are multiple places around the city where you can purchase this pass, including ticket windows at the metro and at the RER . Once you have paid your €5.00 for your card you'll have to 'fill' it with credit, a week pass for zone 1 & 2 costs €19.80, while the month long pass cost €62.00 (other zones vary in price). Be careful when purchasing this pass for a week, as it does not work on a 7 day cycle beginning from the day you purchase, instead it runs from Monday-Sunday each week. So if you arrive on a Thursday this pass isn't going to cut if for you. The month passes run from the first day or the month to the last, so again if you arrive in the middle of the month this won't work for you. INSIDER TIP - Don't lose your Paris Metro ticket: You purchase a ticket to enter the Paris Metro and you need that ticket to exit on the other end. If you misplace it, or lose your ticket altogether you can be subject to a steep fine of €35—which can add up to quite a few croissants. Trust us, we paid €35.00 to learn this lesson the hard way so you won't have to. There are about 300 station throughout Paris and all the major attractions have stops very close to (or directly) at them. As mentioned above if you plan on doing a lot of sightseeing the metro can be a smart way to cover a lot of ground in a short time frame. In some cases you'll need to transfer lines which are all clearly marked and color coded in the underground. If it's your first time in Paris the metro map might look extremely confusing, don't worry it's really not. There are three types of maps you can get from the metro stations—the basic map only shows the metro lines and the main stops, a more detailed version with street names, and finally a tourist map with major attractions as well as city streets, bus routes, and RER lines. The RAPT (Paris Metro Authority) now has an interactive map on their website which you can drop flags at specified locations and find the quickest route to your destinations. This can be a great tool to help you plan your days, but unfortunately it's created with flash so it isn't really mobile friendly. As with the underground Metro system, learning to use the bus system in Paris can save you a lot of time and the bus actually covers more ground than the underground system. The stops are called out on an automated system so you won't need to worry about missing your stop. Riding the bus in Paris has one benefit that the underground metro doesn't—the bus allows you to actually see the neighborhoods as you travel from one place to another, helping you explore the city and find great sights you might have missed if you took the underground. The regular Paris bus system runs from 6:30 am - 9:30 pm (with a few running until midnight), however there is a night bus that runs from 12:30 am - 5:30 am, which is handy for late night parties and early morning flights. This service runs less frequently about every hour on Monday-Thursday and every half hour Friday-Saturday. As mentioned above if you have an early flight the night bus can be a lifesaver getting you to the Gare du Nord for the first train to Charles de Gaulle ​Airport (CDG) leaving at 4:56am​. If you catch the first train from Gare du Nord you'll arrive at Terminal 1 at CDG at 5:28 am and at Terminal 2 around 5:30am. Tickets for the Paris bus system are the same tickets as the ones you use on the Metro. They can be purchased inside the Metro stations, or directly from the bus drivers when you get on the bus. When you get on the bus you'll see a waist height machine by the drive that you use to validate your ticket. Paris has a great public bicycle system called Vélib, with bikes docked all over the city for the public to use. You pay a small fee for the service and another small fee each time you use the bike. The first 30 minutes of each ride is free, so in theory you could use the bike for short periods and only pay the initial service fee. For more detailed information on how the Vélib . And of course, good old walking never hurt anyone and strolling through the city is one of the best ways to really see the city as a local.